Hey, Gizmodo, it’s Friday! We did it! We made it! Oh no, what’s that behind you? RUN!!! What’re you up to this weekend? Plans to see dinosaurs chasing and chompin’ on humans? Clinging to your air conditioner for dear life, like me? I’m going to try and get to Jurassic World. Friends saw it opening night and were pretty excited about the results, so I have hope. 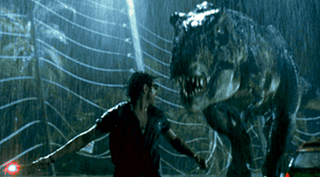 Jurassic Park was the first PG-13 movie I got to see in theaters as a kid, and it both terrified and electrified me (like a fence to keep out a T-Rex that could turn back on at anY MOMENT). What’s the first movie you saw that made a crazy impact on your life? Could all movies use more Dr. Ian Malcolm, when you stop and think about it? Tell us what’s on your mind. Comments find a way.